Traveling While Black. Where do I start? The accommodations on the slave ships? Full-price tickets for a Jim Crow ride? Accidents victims who were refused care at the white hospital, who died on the way to the “colored” one? Before there was Sandra Bland, Walter Scott, or Samuel DuBose, there was Marquette Frye, a motorist pulled over on a steamy August night 50 years ago. After he failed a sobriety test, his brother ran to get their mom to drive the car home to avoid having it impounded. All three ended up arrested, as more cops and more community members arrived on the scene, tensions mounting by the minute. That night all the police brutality, all the unemployment, all the broken American promises in a long-neglected community came due. Rage and fire spread over six days as 34 died, more than 100 were shot, and another 1000 were injured. The financial toll in destruction was upwards of $40 million—more than $300 million in 2015 dollars. Cut to 1991 where police beat motorist Rodney King to a bloody pulp after a high speed chase. In one of the earliest instances of a poli ce-citizen encounter captured on videotape, people around the world watched in horror, certain that police would be found guilty of assault with a deadly weapon or excessive use of force. But the following year the jury couldn’t agree that the officers were in the wrong, so they walked. That’s when people took to the streets, and six black guys pulled white motorist Reginald Denny from his truck and beat him to a bloody pulp—the first blow in a rebellion that lasted five days, in which 58 died, 2,500 were injured, and $1 billion in property was destroyed. Cross dissolve to late July 2015, when I see an advance screening of Straight Out of Compton (pictured above), where director F. Gary Gray films several police encounters from the prospective of those detained: heads slammed against car hoods, chins pushed into pavement. “It’s the unnecessary humiliation that can be a part of policing” that sticks in the black community’s craw, Cube asserted. “They have to be heavy handed with criminals,” he added, “but why do they have to be that way with citizens?” Suffice it to say, it’s been a long, bloody ride. And we ain’t there yet. 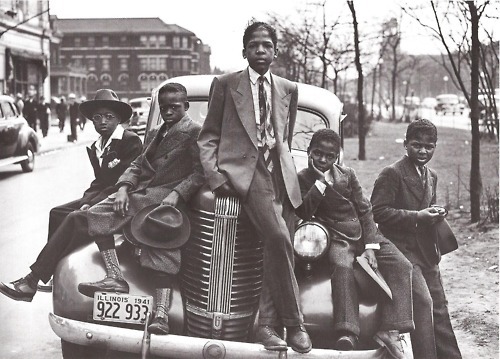 Images: Russell Lee photo of five boys in Chicago on Easter 1941; still from Straight Outta Compton. I think this information should be framed and posted all over the country. Thanks Pam for this insightful piece. It is filled with great information, and the sad statistics. As a child in Detroit, my earliest memory is of the city on fire. The national guard, the fear as a seven year old. Sad to say, the injustice is still real. I have no love for Dr. Dre. but i understand frustration. To quote the late Rodney King ” Can’t we all just get along”? Rodney King crosses my mind from time to time. I don’t think he ever got over that beating, so I was saddened but not surprised that he was dead by 47. Fantastic piece. In pondering where we go from here, it’s so necessary to understand the history. We are not post racial. Thank you for connecting dots for us! New technologies tend to help us press forward. As TV news reports showing Black people being attacked by dogs and water hoses advanced the Civil Rights discussion, videotape and Twitter are forcing a widening range of folks to understand why we insist that #BlackLivesMatter—and why America must do a better job of protecting us. YES!!!! The role of technology cannot be underestimated. Do you think one key difference is that the introduction of the television in American Living rooms was more passive? These new technologies appear to have galvanized and helped organize groups themselves! Could it be that the interaction has encouraged that aspect? I will think more about this issue. Wonderful piece Pam, informative, encapsulating, and moving at the same time. Really provocative and well thought out…I will study you!!! Excited about our exchange. Thank you for taking the time to read and connect!